Thank you for stopping by, let's get acquainted. My name is Dr Barbara L. Ritter and I have lived in beautiful Arkansas most of my life and have been a Yell Co resident since 1977. I gave my heart and life to Jesus Christ in 1985 at 16 years of age and haven't regretted a moment of my Christian experience. 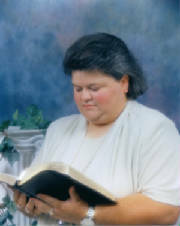 God called me into the ministry soon after my conversion and I was preaching the gospel by age 19. I am ordained with the Pentecostal Church of God. I am a graduate of a Lake Charles, LA Bible College with Doctrate of Ministry degree. I am currently enrolled at the Light Institute in Virgina studying Biblical Counseling. I've had the joy and priviledge over the years of ministering in Revivals, Camp Meetings, Women's Conferences, Fellowship Meetings, FCS Meeting and other events. I started attending VTC in 1991 and soon became the Youth Pastor and Asst. Pastor. Just two years later I was honored to accept the position of senior pastor with a 100% vote for a two year term. After two years the church voted to reinstate me with a lifetime pastorate, and again with a 100% vote. It has been a glorious journey since I first began pastoring. I thank God for chosing me to pastor the greatest church on earth. I cherish the family atmosphere at VTC. The relationships God has given me with the people is very special. The folks are more than members they are my family and friends. I understand the difficulties that life can sometimes have and firmly believe church must be more than a meeting place, but rather a place of restoration and refreshing. I believe that the Holy Bible contains answers to our daily needs and I strive to bring forth the Word with clarity and preciseness so the listener can understand and grow to their spiritual peek in God. In 1999 with God's help, I began writing commentary and homoletics on the KJV Bible as well as studies of prophecy that is relevant for our day and hour in which we live. I want to take this opportunity to invite you to attend one of our services here at VTC. You will be welcomed and ministered to in a personal way. After just one visit I am convinced you will then choose to make this your new home church. VTC is located at JCT 27 & 80 in Danville, AR. If you have any questions just send me an email and I'll get back to you asap.